← YES, Stan Quinn will become one year older on Sep 06th!! ALL THE BEST STAN!! KEEP ON SHUFFLING!!!! Backed by the owners of a large local payroll company, the city’s latest entertainment option has slid into Scott’s Addition. Tang & Biscuit, a shuffleboard bar, opened last month at 3406 W. Moore St. 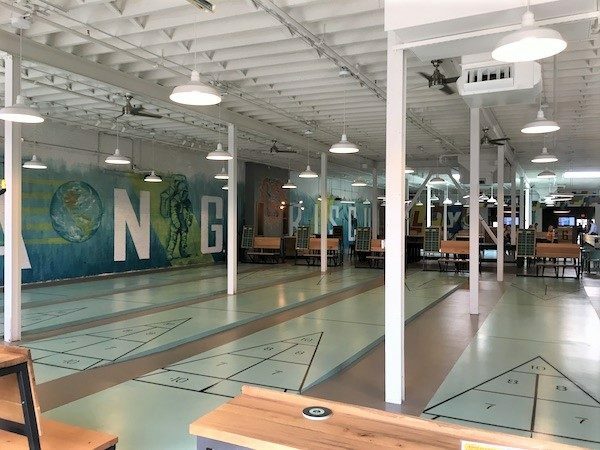 The venue, owned by Dominion Payroll co-founders David Gallagher and David Fratkin, features 10 full-size shuffleboard courts, a full bar, and other games such as giant Jenga and pingpong. It also has a rentable 2,000-square-foot event space. 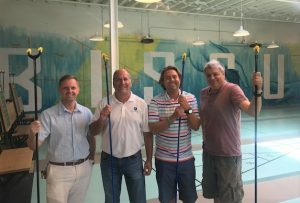 The 18,000-square-foot business is named for the cues and discs players push down a waxed surface toward a target. 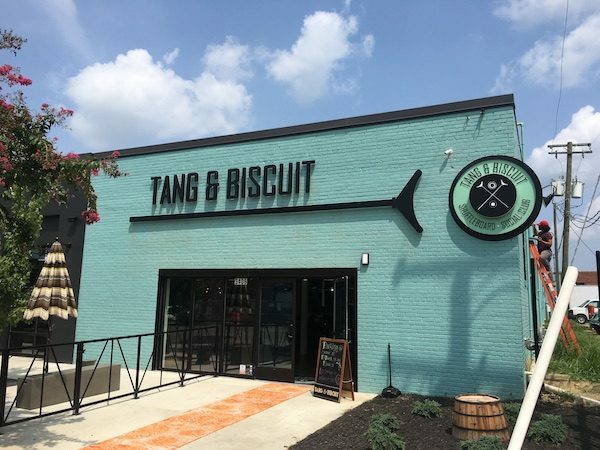 Tang & Biscuit held a soft opening in late August, about eight months after the project was announced. The group purchased the building last year for $1.7 million and invested up to $2 million in the buildout. Greene’s Commonwealth Construction Management was the project’s contractor. 510 Architects was the designer. Gary Chadwick, formerly general manager at Kings Dominion, runs the business. Chadwick said Tang & Biscuit received a warm welcome, partly due to shuffleboard’s broad spectrum of prospective players. “There are so many breweries, this is kind of an example of what entertainment can be when you add in service and a broader range of your target demographic,” Chadwick said. Behind the bar, Tang & Biscuit has plenty of beer and cider taps, as well as a menu of Tang-inspired cocktails. For food, Tang & Biscuit has takes on loaded biscuits and tater tots, as well as salads. The venue opened with a staff of between 80 and 100, Chadwick said, and is open from 4 p.m. to 10 p.m. Monday through Wednesday, 4 p.m. to 11 p.m. on Thursday, 4 p.m. to midnight on Friday, 11 a.m. to midnight on Saturday and 11 a.m. to 10 p.m. on Sunday. Chadwick said Tang & Biscuit is set to host shuffleboard leagues. “We’re probably going to kick them off in the fall. We have to work out the details, but it’ll be recreation,” he said. Tang & Biscuit is exploring the idea of adding more locations of the concept. “We don’t have a city or state in mind, but we’ve been getting a lot of calls from development sites,” Fratkin said. Tang & Biscuit is the latest arrival to Scott’s Addition’s growing entertainment venues. This year, River City Roll opened at 939 Myers St. In 2017, The Circuit Arcade Bar opened at 3121 W. Leigh St.
Bingo, a bar-arcade, restaurant and brewery concept, is preparing to open at 2900 W. Broad St.